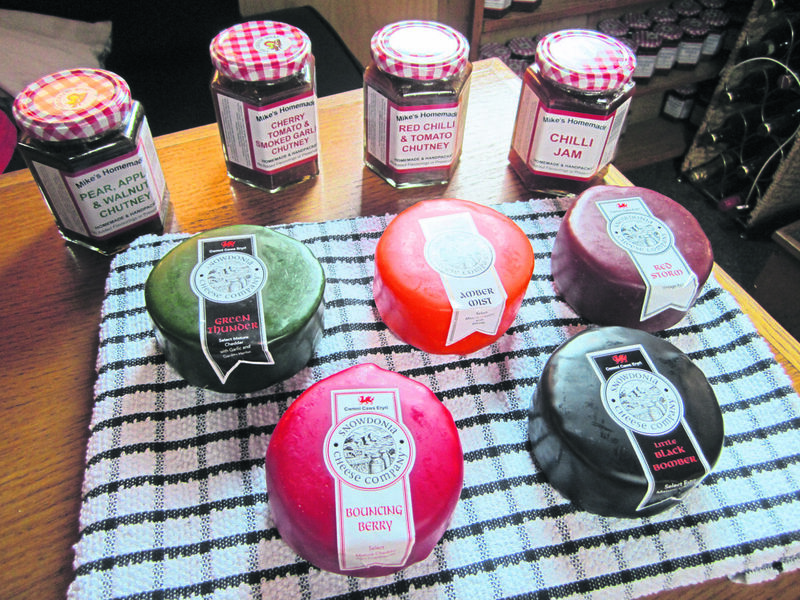 Julie Webb meets ‘the cheesies’ who help to preserve a centuries-old tradition. FANS of Patrick O’Brian’s novels of shipboard life in Napoleonic times will remember how the two friends Aubrey and Maturin always followed an evening’s music with a snack of toasted cheese, brought to them in a silver chafing dish. 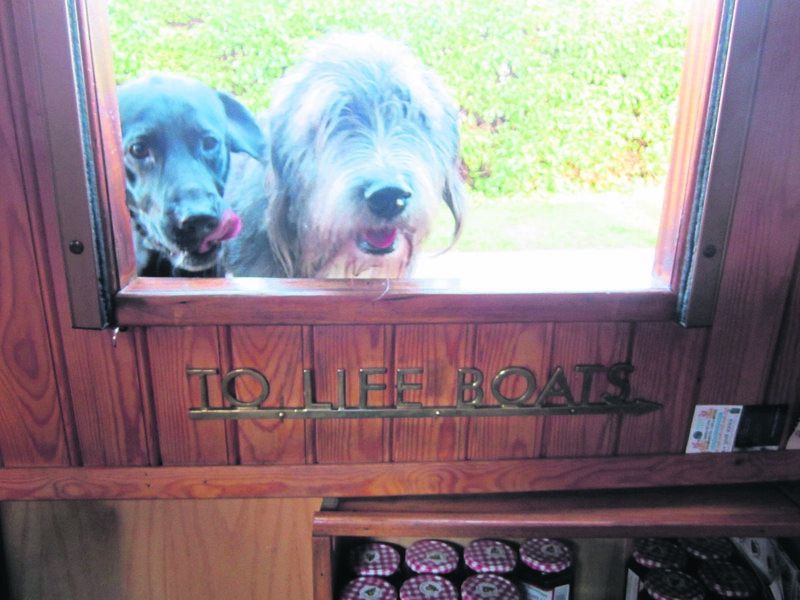 Cheese has an illustrious history as a staple of long voyages because of its keeping qualities and nutritional value as well as its tastiness, so Geraldine and Michael Prescott, who travel the canals supplying a range of cheeses and chutneys to waterway communities, are helping to maintain a centuries-old tradition. Geraldine, a retired secretary, was born in India, where her father was in the Army. Michael, from Doncaster, is a marine electrician. They married in 1995 and rented a cottage in Bath for a while. “We decided to do something different,” said Geraldine. “We bought an old boat and Michael refurbished it, then in 2006 my mum died and left me some money, so we had the shell of this one built by Liverpool Boats. “By this time Michael’s neck and knees had started to go. He couldn’t get into engine rooms any more – (“I could get in,” interrupted Michael, “but I couldn’t get out!”) – so we were looking for something else to do. “We stopped at a village on the Staffordshire & Worcestershire Canal and went into a shop which happened to stock Snowdonia cheese. We bought some and tried it, and a light bulb came on. We phoned the company at their headquarters in Rhyl and they thought it was a brilliant idea: the MD calls us his ‘flagship’! Michael continued: “We started by thinking if we sold 10 a day we’d be happy. But now, take Linslade Canal Festival for instance, we sold 308 cheeses between 11am and 5pm! 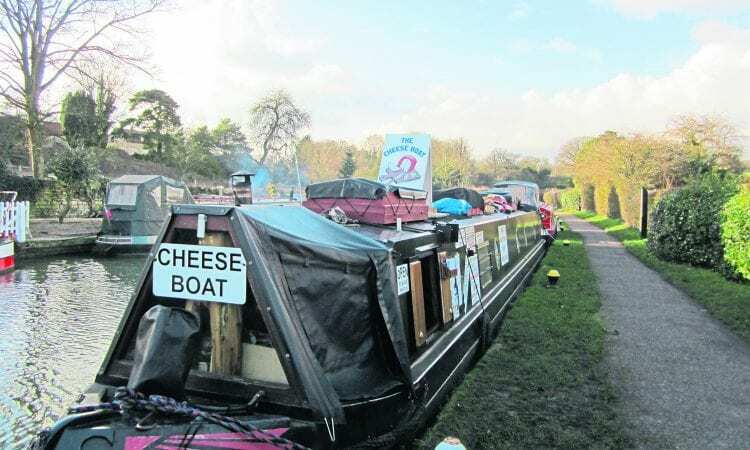 You knew where the Cheese Boat was because you could see the queue along the towpath. Four years ago they were iced in for six weeks outside the Greyhound at Sutton Stop – not a bad place for an enforced stay, and accessible to local deliverers of gas, coal and groceries. They enjoy the camaraderie and reciprocal relationships of the cut. The itinerary of the 65ft Cheese Boat is planned around events the Prescotts are asked to attend. 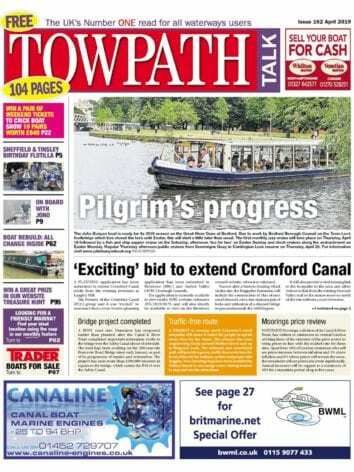 Trying to support new ventures as well, where they can, they travel between Stafford and London, and down the Oxford Canal as far as Thrupp. 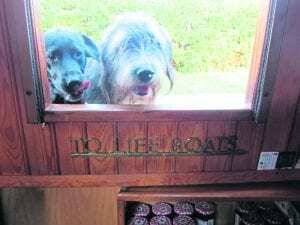 They’re regulars at Foxton Locks and Hawkesbury Junction, Braunston (for the historic boats rally), and Blisworth and Stoke Bruerne, where they’re a popular feature of Christmas markets. “A cheese and a jar of chutney make a good present,” said Geraldine. 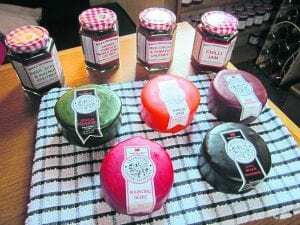 Cheeses come in colourfully waxed 200g mini truckles, and the chutneys – their natural accompaniment – have attractive gingham-patterned lids. To keep life simple, everything costs £4. The Mike of the ‘Mike’s Homemade Chutney’ label is not Michael Prescott but award-winning preserve maker Mike Dentith, of Woodseaves in Shropshire. The boat is inspected regularly, of course, by environmental health officers. Cheeses bear a ‘best before’ date of three or four months from manufacture, and will keep well when opened if wrapped in cling film, says Geraldine – who also related this warning tale on the subject of how to serve them.